None of them will object if we leave it to the reader to discover in those articles the individual applications to the psychoanalytic field, to focus instead for a moment on just one contribution in particular. 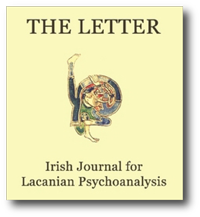 The work with which we open is based on a publication and is an extract from a book which really deserves to be noted since it marks the arrival of the first major work (and again hopefully the first of many more) in the English language by someone who has contributed in no small measure to Lacanian psychoanalysis in Ireland. It represents a session in the 1994-95 teaching seminar of Charles Melman, which went by the overall title Returning to Schreber. This one session reproduced here, of the 15th December 1994, was devoted to following up on the consequences of the development of Lacans formulae according to which ‘the unconscious is the social and ‘ the subject $ is what is supported between two signifiers’. One of the immediate consequences of taking seriously these statements is to undermine the position whereby psychoanalysts remain within the field circumscribed by the family, consider ‘that the field of their responsibility comes to a halt at the boundary of family organisation’ and act as though they do not have to make any pronouncement, to become engaged, when they are challenged by the social field’. The least one can say is that such a charge could not be pressed against the other contributions to what constitutes this rather hefty edition of THE LETTER. Happily, neither could it be levied at those who will be participating in the ninth Annual Congress of APPI which will be in full swing as this present issue sees the light of day. A quick look at the programme for the day sees, alongside sections on Lacan’s Seminar, Freud’s work and theoretical and clinical issues, also issues such as racism in Ireland, questions of pedagogy, on addiction, on homosexuality, and for the first time, on the birth of the Irish hero. In another sense also this Return could be seen to have a more serious implication for psychoanalytic groups themselves, not unlike the force and weight of Lacan’s ‘Return to Freud’. While it can be reduced to providing simply a more useful reference in orienting our practice, in itself a laudable point to bring home, it perhaps also serves here to remind us of and underline the danger inherent to any discourse closed onto itself, one which only makes it’s ever-ready ears available to it’s own ‘little voices’ restricting its discourse to it’s own little family. Melman points us to Antigone: there is something that the analyst (cor)responds to that does not belong to the group. In this sense, although there may be psychoanalytic groups, it becomes doubtful whether there can ever be such a thing as a group of psychoanalysts. The work is also to eb noted for another reason; in addition, this work ‘in the English language’ was made possible by someone about whom one could equally say ‘who has contributed in no small measure to Lacanian psychoanalysis in Ireland’, a tireless translator of Lacan, the hallmark of whose works is reduced to the small-print of an all too familiar phrase in the footnotes*. Belated congratulations to all concerned.